 Quob Stables Equestrian Centre is looking to recruit an Assistant Stable Manager, to ensure the smooth running of our busy riding school, competition and training centre, on a day to day basis. The successful candidate will need to be highly organised and able to take charge of the junior staff to organise and plan the day, deal with vet and farriers, as well as responsible and reliable with high standards of horse care. The ability to effectively run a small team of staff is a must and clipping, turnout and trimming skills are essential. BHS qualifications or teaching experience would not be a necessity, but the candidate must have proven industry experience. The role is full time to include weekend and evening work. We can offer a competitive salary, on site accommodation, and opportunities to compete and train for BHS exams for the right candidate, as well as 28 days holiday per annum, contract, sick pay, and the opportunity to bring your own horse on working/staff livery. DBS check will be required for the successful candidate.